It’s time to think outside the toolbox. High-resolution displays and dynamic content simulate a skylight that can be seen from several levels below. Photo Courtesy Caleb Tkach. You’ve probably walked past waterfalls in urban settings that were not real waterfalls, and cherry blossoms everywhere that were digital renditions. 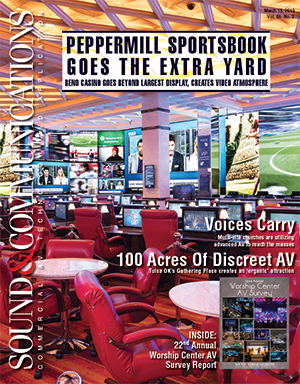 The demand for unique digital-art installations or expansive video canvases to transform spaces is on the rise, as evidenced by the many projects completed this year. How does the designer craft and engineer a pleasing visual environment for passing crowds, while also engaging and enriching the experience of individual viewers? The secret might lie in combining advanced skills with the latest tools from different disciplines. At an Archtober event held at the New York School of Interior Design in October, I attended a presentation entitled “Making Places: Designing for the non-traditional media canvas.” Michael Schneider, Senior Designer and AV Technologist at ESI Design, showed how creators can navigate both architecture and content to craft experiential space—from expansive touchscreen walls to massive, motion-activated murals. He urged attendees to think outside the conventional “TV box,” suggested visualization of creative content far beyond TV aspect ratios and recommended the use of advanced technologies, such as mobile interactivity, virtual reality (VR), augmented reality (AR), 8K video and super-high-resolution LED displays, to create dynamic spaces. the existing architecture, and onsite media staging and fine-tuning are all critically important. In mid-November, ESI completed an innovative installation at 900 North Michigan Shops in Chicago IL. The project required that a 30-year-old complex be transformed into a 21st-century destination and an attraction for shoppers, diners and visitors. 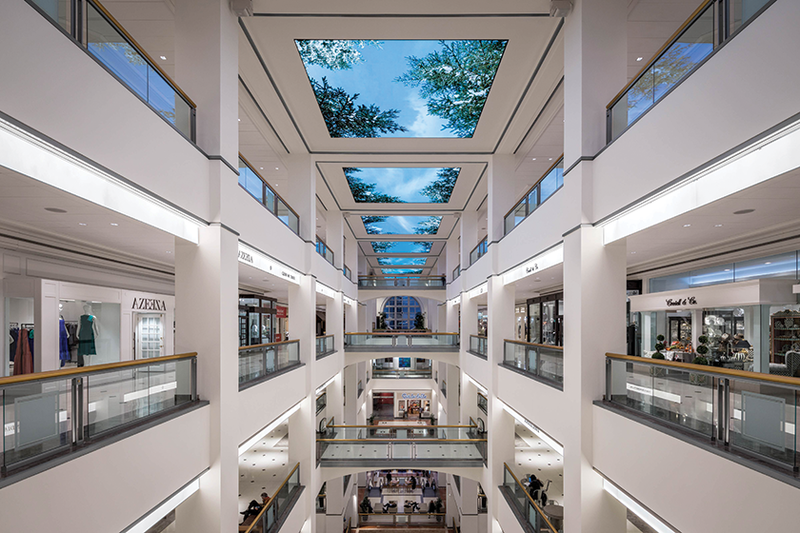 Visible from all floors of the complex, a 190-foot ceiling digital canopy, composed of Mitsubishi Electric’s Diamond Vision ultra HD LED panels, simulates an array of skylights, connecting the complex’s interior to the outside world. Modular digital panels preserve the existing architectural appearance while transforming the ceiling into windows to a virtual world. Digital media of swaying trees and flocks of local birds flying in ever-changing patterns creates the illusion of outdoor spaces; other media loops feature luxury brand logos and promotions to attract visitors and motivate them to travel upward and explore the entire shopping complex. throughout the world,” Stacy Kolios, Senior Director of Marketing for 900 North Michigan Shops, said. Creating a high-impact, multisensory show that blends seamlessly with architectural spaces and enhances the experience of an audience in motion requires partnerships with companies that have varied areas of expertise, as well as the use of tools not typically found in the AV toolbox. Much of the content for the Chicago project, for example, was captured with a RED Weapon 8K camera, an ultra-high-end device originally developed for digital cinema production. ESI worked closely with Float4 to customize the content management software (CMS). Templates within Float4’s CMS can also be used by building management and commercial tenants to customize content. The display mounting system, engineered and custom built by Mitsubishi Electric and Poblocki Sign Co., includes hoists to lower/raise the display, thereby enabling the maintenance crew to climb onto the back of the modules for servicing. ESI’s toolbox for the many projects it designs features several innovative software programs, including TouchDesigner, Full Flood lighting designer and the Real Engine previsualization platform, which is also popular with videogame designers. In past years, architectural video solutions of this scope might have required the resources of Disney Imagineering or Universal Studios. Fortunately, the latest digital tools, along with a growing culture of multidisciplinary creative partnerships, have now brought this kind of communications power within reach for visionary design firms that work for a wide range of commercial and entertainment clients. Previous ArticleOccupational HazardsNext ArticleCan Technology Hinder The Worship Experience?